Ethan Hawke is bashing a typewriter with a golf club. 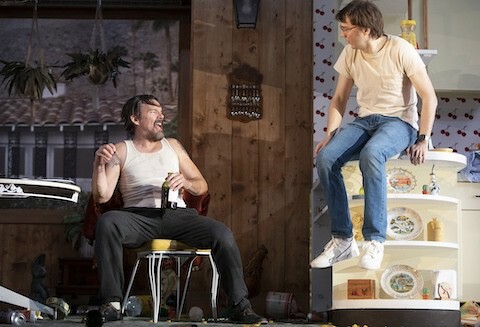 Paul Dano is maniacally slotting bread into nearly a dozen pop-up toasters littered across every surface of a suburban kitchen. Yes, the men have devolved into badly behaved boys. 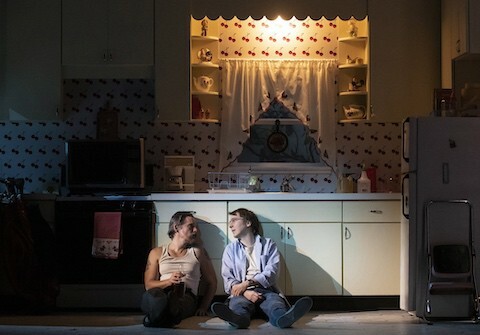 By this point in the revival of Sam Shepard’s True West that opened on Broadway tonight, it’s tough not to wonder: So, what else is new? 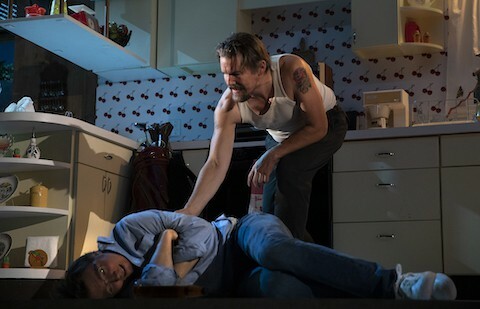 Shepard’s acclaimed 1980 play about two brothers who spiral into primal states of pure id must have seemed like just the ticket for Roundabout Theatre Company to stage at this moment of national reckoning with men who’ve lost all civility. (Openings in Hawke and Dano’s busy film schedules probably didn’t hurt, either.) But star-power short-circuits in this curiously light-hearted production from director James Macdonald at the American Airlines Theatre. What’s ultimately meant to seem a deep, dark dive into the conflicts of the male psyche feels rather like a superficial scratch at the surface. 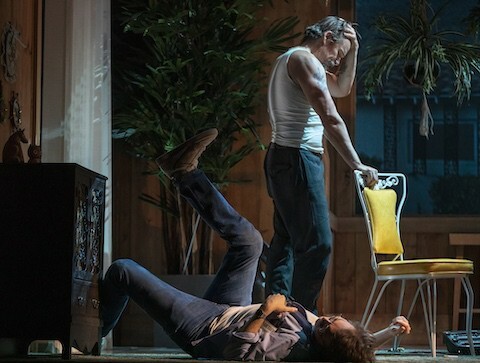 The psyches are male in this case because women are not, in Shepard’s true west, assumed to also be subjects of the same push-and-pull of art and commerce, ambition and failure, order and chaos. No, such tug-of-war is a boys-only game, and so it goes. The men are in their mother’s house (naturally), which Dano’s character has promised to watch over while she’s away. He’s working diligently on a screenplay. Hawke plays his brother, a louse who’s just rolled in from the adjacent dessert with dirt-stained clothes and an irreverent look in his eye (we’re somewhere within driving distance of L.A.). Over the course of nine scenes, their roles reverse — the bum talks his way into a movie deal, while Poindexter develops wild dreams of living off the land. It’s a long road for the play to travel, one Shepard has laid with enough wit to distract us from realizing how far we’ve come until suddenly everything’s upended in front of us. (The show runs two hours and 15 minutes with intermission.) But the reversal feels more like a natural extension of the production’s sitcom aesthetic and pacing rather than a well-earned dramatic climax in a psychological drama. Hawke is undoubtedly a master of his craft, and his performance is delightful to watch. But this bad seed doesn’t feel capable of sprouting into real violence. The threat he poses to the quaint suburban life contained in Mimi Lien’s shoebox set never push beyond harmless distraction. Dano, so often an embodiment of Millennial ennui on screen, plays convincingly uptight but is less believably unraveled (a button-down wrapped around his head only does so much convincing). One essential truth of Shepard’s play seems impossible for any production to obscure, if it blazes most especially bright in 2018: Men are always a hairsbreadth away from regressing to their basest instincts. But we hardly need a night at the theatre for proof of that.